This certificate can be stacked and earned credits can be applied toward a Medical Radiologic Technology AAS Degree. This course of study focuses on the underlying scientific theory, sectional anatomy, pathology and clinical protocols. Emphasis is placed on patient care and safety, principles of magnetism and the physical and chemical interactions of living matter within magnetic fields. 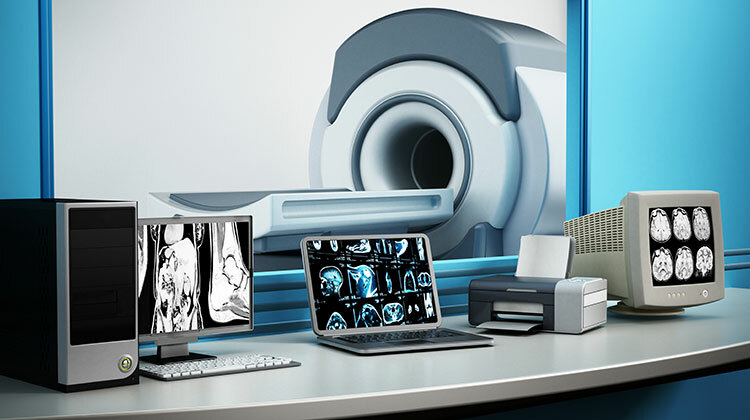 MRI technologists find careers in a variety of healthcare settings and locations, including hospitals, outpatient clinics, physician’s offices and extended care facilities. Additionally, this advance training empowers graduates for possible careers in medical research, sales, education, administration or supervisory/management positions. In this program, students learn magnetic resonance physics, equipment operation and methodology, cross-sectional anatomy and patient care, while acquiring hands-on MRI imaging skills. This program is a 12-month post-associate degree program that provides didactic and clinical instruction to currently certified American Registry of Radiologic Technologist (ARRT) or Nuclear Medicine Technology Certification Board (NMTCB) and state licensed (as applicable) Radiation Therapy. This is an application based program. Students interested in applying to the Magnetic Resonance Imaging Program should read the latest Magnetic Resonance Imaging program requirements. Applications will be accepted starting September 1, 2018 until December 3, 2018. Applications will be accepted until all clinical assignments are filled. Classes are currently scheduled to start, Spring Semester 2019. The class schedule will be announced soon. The Medical Radiologic Technology Program is accredited by the Joint Review Committee on Education in Radiologic Technology.